A great way to spend an afternoon is touring from the Village of Cordova Mines to the South End of Cordova (Deer Lake) Leaving west from Cordova, turn right on Preston Rd, and then turn right on Fire Route 18. Follow Fire Route 18 north for about 3 km and you will come to a parking area in a clearing, quite close to the southern end of Cordova Lake. Listen and you will hear the roar of the Cordova dam and spillway, built by Cordova Gold Mines Ltd. 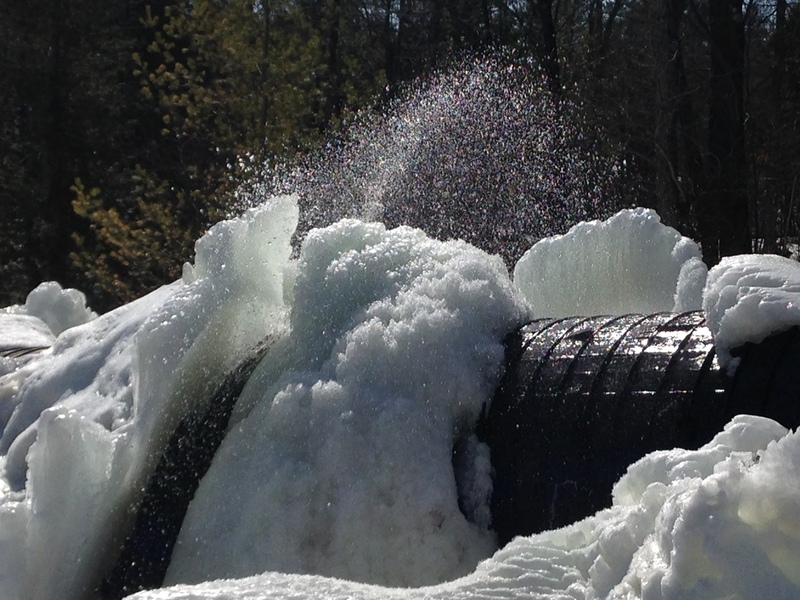 The water from the Deer lake dam was conveyed through a six foot flume, a distance of 1550 feet, giving a head of 74 feet at the power house, where it drove two turbines of 800 and 400 H.P. 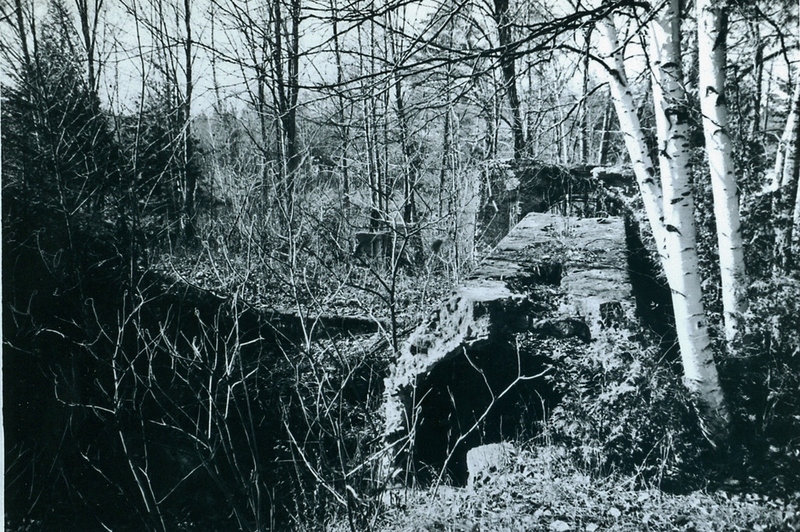 The site of the power house is now overgrown, but at one time was an impressive structure. The turbines were directly connected to a 250 K.W. generator, and the 2,200 volt current was conveyed over 3 aluminum cables to the transformer at theCordova mine, where it was stepped down to 550 volts for driving motors and 110 volts for lighting. The 800 HP turbine drove endless cotton ropes and a large two-stage compressor, having a capacity of 5,000 cubic feet of free air per minute. The air was conveyed three miles through a 12" pipe at the mine at Cordova at 100 p.s.i. 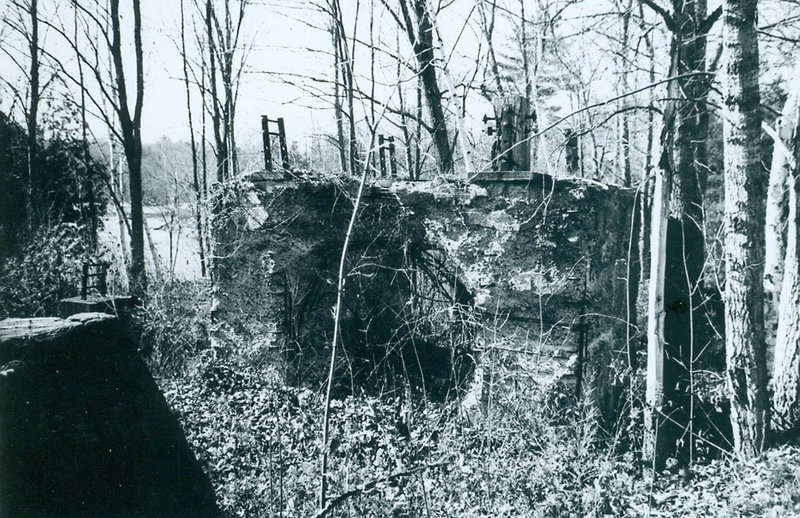 These ruins are probably part of the turbine and compressor system at the power house. Following a path parallel to the river will lead you to the modern generating station owned by the Algonquin Power Systems of Mississauga. (Watch carefully for poison ivy) A sign on the building gives a complete explanation of the facility, but of particular interest in the wooden water flume reminding us of yesterday's technology. Returning to you car, and following the one-way road back, you will pass through the ruins of the Ministry of Natural Resources Fish Hatchery. 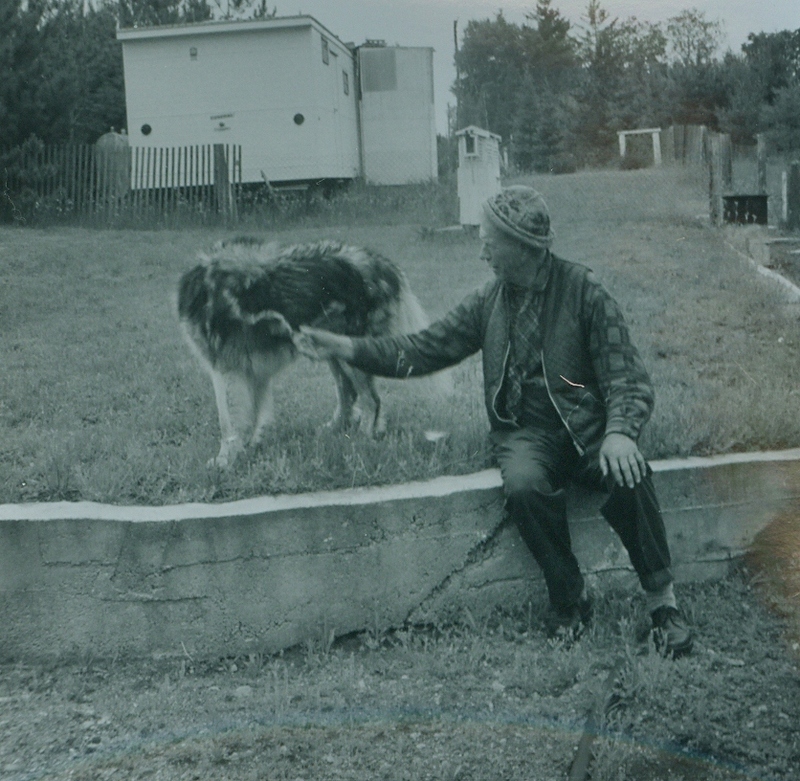 The original station, built in 1938, was the first permanent provincial fish culture station constructed to hatch and rear muskellunge (Esox masquinongy). The station had the facilities to hatch approximately 5 million eggs and 2 ponds to rear muskellunge (also called maskinonge or "musky") from the fry to the fingerling stage. In 1947 two additional ponds were constructed. Tracing your steps back, following the river downstream, there are two interesting stops. You will notice that there are no cottages on the river side as all this land is owned by the Ministry of Natural Resources. About a half a mile down you will find a number of large rocks blocking a driveway. Park the car and walk in for a beautiful sight - Scott's Dam - a series of stepped waterfalls, (not a dam at all) and more upstream. 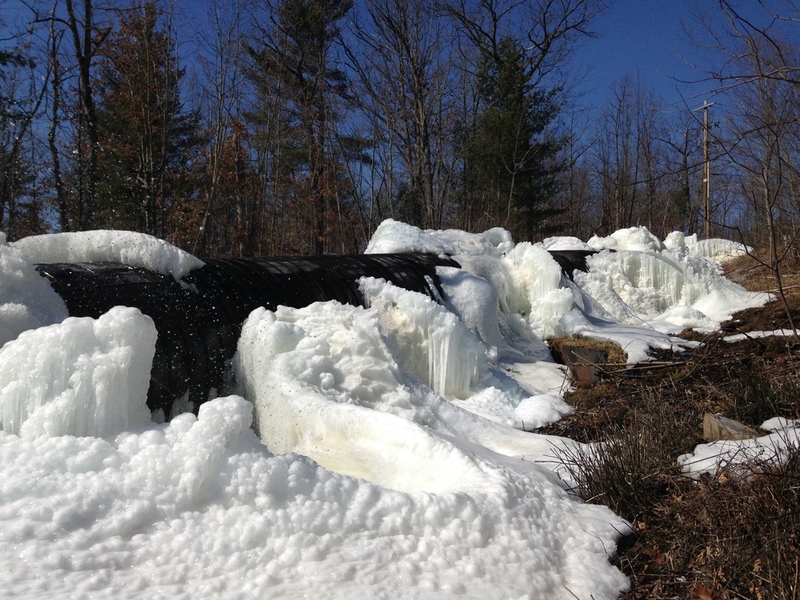 This is a favourite local swimming hole, although in late summer the water flow can be a bit scant. It is also a good launch site for canoes or kayaks, as you can float all way back to Marmora from here, through Belmont Lake and the Crowe River. After leaving Scott's Dam and continuing downstream, keep your eyes open on your right for Butchy's gravestone at driveway #260. Butchy wasa dog, and the best friend of"Doc" George Hammond, a well known local taxidermist. Butchy died in 1961 and was sadly missed by many. See more of Doc Hammond's work in "Artists in the Archives" Just click here.